Back row, from left: Josh Rennick, Ashley Lybbert, Bryana Hairston, Colin Kearney. Front row: Brandon Dristy, Samantha Kaye-Toral. Brandon Dristy won the league championship at 108 pounds for the Rams' wrestling team, advancing to CIF postseason compeition. Ashley Lybbert was selected to represent the girls water polo team. "She has become a big part of the team's offense and defense," said her coach, Audra Woods. "She always comes in clutch when the team needs her." Colin Kearney, who battled back from injuries this season, played with a broken wrist in the boys soccer team's last game of the season and was an inspiration to his teammates. "While he has not been able to play on the field most of the season, Colin has continued to support his teammates and encourage them to do well," said his coach, Robert Bokma. "Even though (the broken wrist) slowed him down some in the last game, he did not allow it to keep him from playing hard and helping to lead his team." Samantha Kaye-Toral was selected to represent the girls soccer team, which has a home game against Citrus Valley in the first round of the CIF playoffs on Thursday. Junior Bryana Hairston was selected from the girls basketball team, which opens the playoffs at Savanna on Saturday. "Bree had a great week and continues to be our spark in practice and in our games," said her coach, Kyle Rouse. "She also is our defensive stopper and shut down two very talented opponents this week as well. She has to be on the floor and when she's not, you can really tell." Senior forward Josh Rennick was chosen for the third time as a representative of the boys basketball team, which wrapped up its season last week. He averaged 12.4 points per game for the Rams. 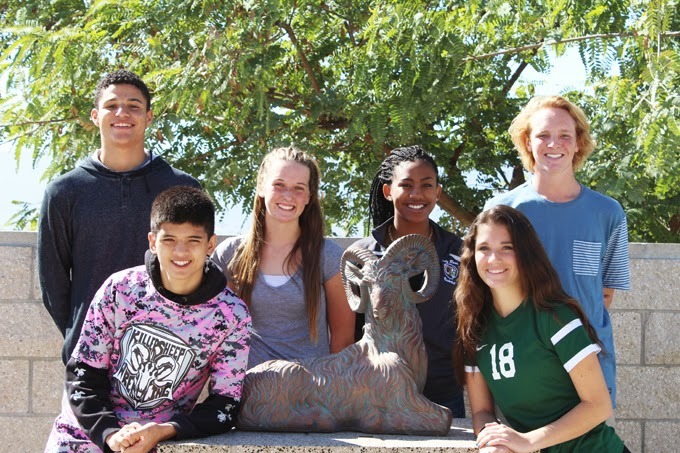 These athletes will be eligible for selection as Murrieta Mesa High School's Athletes of the Month, which will be announced the first week in March.